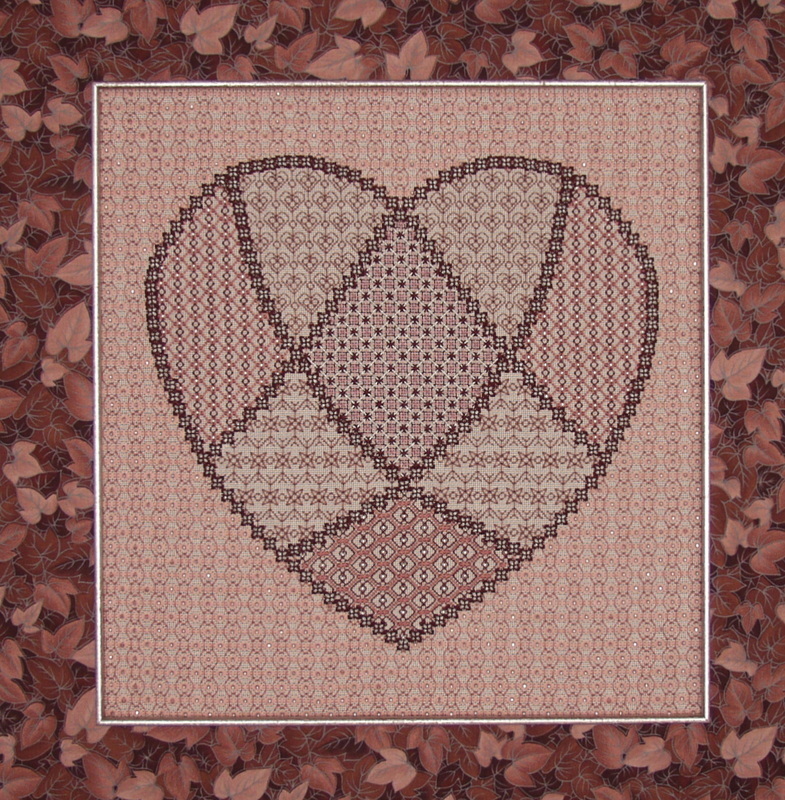 This elegant heart design was planned as the cover of my book, The Heart of Blackwork, which was published in June, 1992. The book, as well as this class, focuses on unconventional blackwork techniques and on certain refinements that improve the appearance of reversible blackwork patterns. The design has examples of original blackwork treatments that include irregular stitch lengths and composite patterns that combine blackwork with exposed canvas patterns, couching overlays, and "simulated darning." The design includes patterns that use "merged stitches" to make lines more attractive, and sequences are manipulated to keep the stitches from shifting in the open holes as they are laid.All of the patterns in the design will be executed in the reversible technique. Some class time will be spent focusing on the development of original blackwork patterns and on my methods of charting sequences that provide optimum visual satisfaction. This elimination of the inherent glitches of the double running or reversible method of executing blackwork has been the hallmark of my experimentation and is useful in handling other types of stitch sequences as well. The threads used are floss and pearl cotton in two sizes, and some Coronet braid and Kreinik metallics in two sizes. Two types of beads will be added as special accents to three of the patterns as well. COLOR CHOICE: Four combinations offered - burgundy-mauve with silver metallic (pink canvas), blue-silver (blue canvas), red/coral-gold (sand canvas) or teal/aqua-gold (sand canvas). PREWORK: Heart outline must be completed prior to class. Choice of three stitches for this step. Estimated time: 15-25 hours depending on stitch chosen. 1. To introduce students to unconventional styles of blackwork patterns. 2. To show students a variety of ways to keep reversible blackwork patterns uniform by manipulating the sequences and planting the needle strategically on the return trip to avoid crooked stitches. 3. To share other refinements in doing the double running technique. 4. To share concepts in the development of composite patterns, using combinations of open canvas treatments with couching and blackwork accents. 5. To teach ways to add beads as part of a stitch sequence - upright and/or diagonal stitches. TEACHER PROVIDES: All materials needed to execute the design, a colored photograph, the mail-ahead segment, and a comprehensive instruction booklet. STUDENT PROVIDES: An 18" stretcher frame, a clamp or weight to secure the frame to a table, a laying tool, embroidery scissors, and a needle threader along with a lamp/magnifier, if needed.